Conversational interface-based devices are quickly gaining popularity with devices and technology like Amazon Alexa, Google Assistant (Google Home), Apple Siri, Microsoft Cortana, Samsung Bixby, and an increasing number of new entrants into the space. Voice-enabled digital assistants are increasingly becoming a part of people’s daily routines. These devices are introducing the concept of the pervasive, voice-activated assistant that enables a wide range of capabilities from conversational commerce to personal business assistant capabilities and more. The rapid adoption of voice assistants coupled with the increasingly advanced technological growth of voice-enabled devices are leading many executives to explore and adopt a voice strategy for their organization. Similar to how previous technologies such as web, search, social, and mobile have led to disruptive innovation, voice technologies, coupled with artificial intelligence capabilities are proving to be the next disruptive technology. The burgeoning voice-first revolution will require organizations to rethink just about everything related to business processes – and change the future of how employees and customers interact. For employees, voice technology will help to streamline and automate previously manual processes, enabling brands to save valuable time, resources and costs. For customers, voice will open up opportunities to conveniently engage with businesses through all types of devices, enabling brands to improve digital customer experience and leverage data to offer more personalized and predictive services. 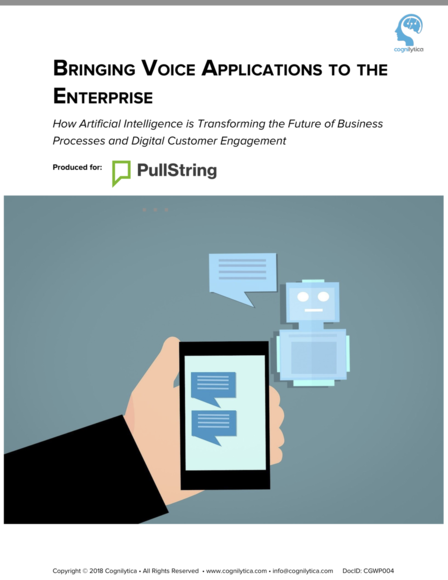 This white paper explores how voice applications are transforming business processes and digital customer engagement strategies, impacting eight primary functions across industries: sales, customer experience, marketing, product, human resource, finance, information technology, and legal.